In historical times, present-day Togo lay between the powerful kingdoms of Ashanti and Dahomey. From the 11th to 16th centuries, various peoples migrated there from neighbouring regions, including Ewe people from the area of present-day Nigeria, who comprise the majority ethnic group today. European slave trading posts were established on the coast in the 16th century. In the late 19th century German claimed control over what was called Togoland, and after World War I this was claimed and divided by Britain and France. British Togoland voted to join the Gold Coast, becoming independent as part of the nation of Ghana in 1957. French Togoland remained separate and became independent as the Togolose Republic in 1960. A military coup in 1963 replaced an elected government, and another coup in 1967 saw Gnassingbé Eyadéma assume the presidency, maintaining a one-party state until 1991, when under political pressure, opposition parties were legalised. Eyadéma remained in power until he died in 2005, and amidst further unrest was replaced by his son, who has won elections since. Anti-government protests that began in August 2017 have faced government suppression. Togo’s economy is based on exports of phosphate and commercial plantation agricultural crops, including coffee, cocoa and groundnuts. The phosphate industry was nationalised in the 1970s, but has declined since the 1990s, in part due to falling world prices and increasing foreign competition. Tourism has become less important to the economy since the 1990s because of political issues. Togo has relatively high, but seasonal, rainfall. There are no major rivers in much of the country, and many smaller rivers are ephemeral. Groundwater supplies most public water schemes in the country, including many major cities. Groundwater is also widely used in the phosphate and other industries. Please cite this page as: Gnazou, Sabi, Tauirou, Akakpo, Agouda, Upton, Ó Dochartaigh and Bellwood-Howard, 2018. Togo. Map developed from USGS GTOPOPO30; GADM global administrative areas; and UN Revision of World Urbanization Prospects. For more information on the map development and datasets see the geography resource page. Togo is a narrow country extending from the border with Burkina Faso in the north to the Atlantic Ocean (Gulf of Guinea) in the south. The north of the country is dominated by savannah while the coast is generally a low lying plain with numerous lagoons and marshes. The Togo Mountains extend from the south west border with Ghana to the north east border with Benin, reaching a maximum elevation of over 900 m.
The climate of Togo is classified as Tropical Savannah. Annual average temperatures are slightly higher in the north and lower in the south. They also decrease with altitude in the mountainous regions. Precipitation is generally lower in the north and higher in the south but also increases slightly over the mountainous regions. Precipitation and temperature vary throughout the year. Average temperature across the country shows two peaks throughout year in March and November. When averaged spatially across the country, precipitation shows a relatively wet period between April and October; however this is split into two distinct wet seasons in the south of the country, which occur during April-July and September-October. The River Oti flows from Burkina Faso in the north, through Togo and into Ghana where it enters Lake Volta. The River Mono drains south from the Togo Mountains, marking the border with Benin, before entering the Gulf of Guinea in the south east of the country. The largest lagoon along the coastal region is Lake Togo, which is fed by the Zio River draining the south western part of the Togo Mountains. The Department of Water Resources, which sits within the Ministry of Water, is responsible for river flow gauging. All observed data is held within the Department of Water Resources and will be made available online through the Systèmes Intégrés d’information sur l’eau project. Major surface water features of Togo. Map developed from World Wildlife Fund HydroSHEDS; Digital Chart of the World drainage; and FAO Inland Water Bodies. 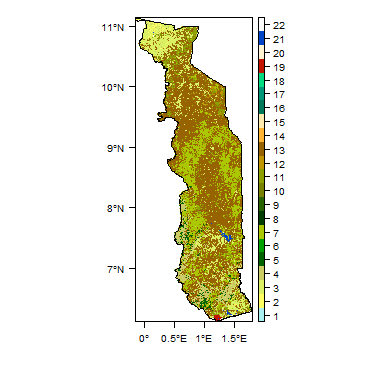 For more information on the map development and datasets see the surface water resource page. Clay-rich Lixosols, which are common in the northern part of Togo, generally reflect stable geological conditions and natural savannah vegetation. Leptosols are common along the Togo Mountain chain. These are generally shallow soils that form over hard rock. To the south of the mountainous region, iron-rich Plinthosols are dominant. These typically form over gently undulating landscapes. Nitosols, which form on alluvium and are generally very productive, are common along the low-lying coastal plain in the south of Togo. Fluvisols have developed along the valley of the River Oti in the north and the River Zio in the south. Soil Map of Togo, from the European Commission Joint Research Centre: European Soil Portal. For more information on the map see the soil resource page. Land Cover Map of Togo, from the European Space Agency GlobCover 2.3, 2009. For more information on the map see the land cover resource page. This section provides a summary of the geology of Togo. More detail can be found in the references listed at the bottom of this page. Many of these references can be accessed through the Africa Groundwater Literature Archive. Geology of Togo at 1:5 million scale. Based on map described by Persits et al. 2002/Furon and Lombard 1964. For more information on the map development and datasets see the geology resource page. Coastal Basin Cretaceous – Pleistocene (Quaternary) Basal unconsolidated sands, limestone, marl, phospharenite, continental sediments and Quaternary sands. Sequence deposited in a compartment of the Adina Fault in the south of Togo. Dahomeyide Belt (External, Suture, and Internal Zones) Late Proterozoic – Early Paleozoic The Dahomeyide Belt is located on the eastern boundary of the West Africa Craton. It consists of a series of nappes and thrust sheets representing the external, suture and internal zone of the Pan-African Orogeny. The external zone comprises two metasedimentary structural units (Buem and Atacora), which are tectono-metamorphic equivalents of the lower and middle sequences of the Volta Basin. The eastern margin of the external zone is dominated by reworked Eburnean granitoids. The suture zone forms a chain of small mafic to ultramafic massifs (Akuse, Agou, Ahito, Djabatouré, Kabye and Derouvarou). These rocks represent the roots of an arc-type crust, containing granulitic and eclogitic metasediments (kyanite and garnet-bearing quartzite and gneiss), pyroxene meta-cumulates, carbonatites, amphibolites, serpentinites and talc-schists. The internal zone in the East, which corresponds to the Benin-Nigerian Plain, comprises ortho- and migmatitic-gneisses, volcanic-sedimentary complexes and several granitoid intrusions. The Dahomeyide Belt was deformed during five phases of the Pan-African event. Bombouaka and Oti Supergroups (Volta Basin mega-sequences) Neo-Proterozoic Continental rift deposits consisting of megasequences of sandstone (Bombouaka Supergroup) and mudstone (Oti Supergroup). Dorsale de Leo ou de Man (West African Craton) Neo-Archean (2064±90 Ma) – Lower Proterozoic (2300-1600Ma) Acidic to basic ortho-metamorphic rocks (gneiss, migmatite, amphibolites, pyroxenite) and granitic plutonic rocks. Polycyclic basement that outcrops in the north of Togo. 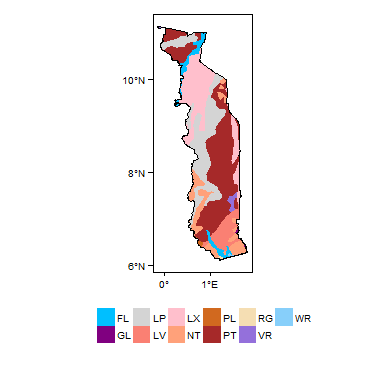 This section provides a summary of the hydrogeology of the main aquifers in Togo. More information is available in the references listed at the bottom of this page. Many of these references can be accessed through the Africa Groundwater Literature Archive. 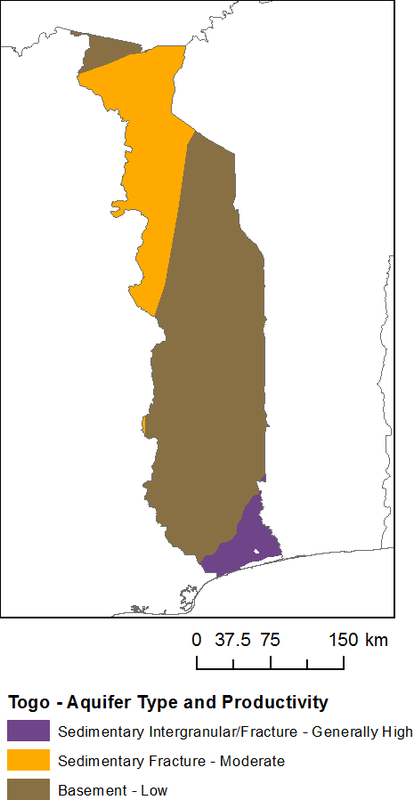 The basement aquifers and Volta Basin aquifer represent 94% of the area of Togo. The basement is predominantly composed of low permeability granite, gneiss and migmatite and groundwater occurs in the weathered horizon or fractures. The Volta Basin comprises sandstone and quartzite while the Coastal Basin is a layered sedimentary sequence that dips gently from north to south. These aquifers are separated by thick, low permeability aquicludes. Quaternary Sand Aquifer This forms a 2-3km wide aquifer along the coast and is typically exploited by wells for domestic use. Flow is predominantly intergranular and the aquifer is unconfined. The properties of this aquifer are largely unknown. 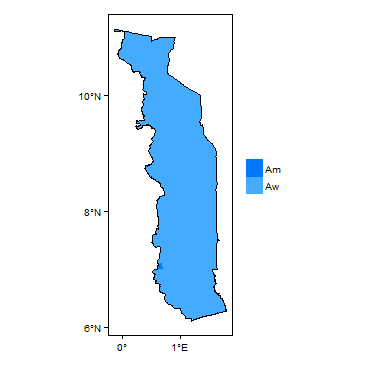 The aquifer thickness varies from 10 - 30 m and the water table depth varies from 0.5 - 3 m.
Continental Terminal Aquifer This is the most heavily exploited aquifer in the coastal basin, providing the drinking water supply for the city of Lome. Flow is predominantly intergranular and the aquifer is unconfined. Transmissivity is typically on the order of 10-³ – 10-2 m²/s. Storage is typically 1-8%. Borehole yields generally vary between 10 and 200 m³/h. The aquifer thickness varies between 20 and 80 m, the water table depth varies between 1.5 and 50 m, and boreholes are generally drilled to depths of 10-60 m.
This aquifer is overexploited for drinking water and industrial use in the Lome Region. Recharge occurs directly from rainfall. Paleocene Limestone Aquifer This is a confined aquifer in which fracture flow is dominant. Transmissivity is typically on the order of 10-³ to 10-² m²/s. Borehole yields generally vary between 20 and 150 m³/h. 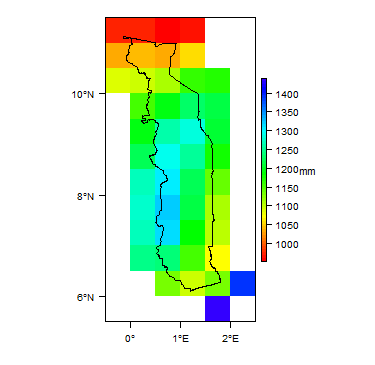 The aquifer thickness varies between 15 and 40 m.
Recharge occurs in the north of the basin by infiltration through the Continental Terminal aquifer. Maestrichtian Aquifer The Maestrichtian Aquifer comprises sandstone (and sometimes sandy limestone) and flow is predominantly intergranular. It is mainly exploited in the northern part of the basin where it is more easily accessible, although it remains confined across the basin. 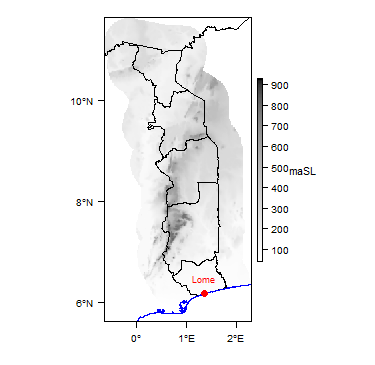 The lateral extent of this aquifer towards the south of the basin is currently unknown due to the significant depth of the sediments. Transmissivity is typically on the order of 10-3 – 10-2 m²/s. Storage is typically 1-3%. Borehole yields generally vary between 15 and 140 m³/h. The aquifer thickness varies between 5 and 25 m and boreholes are generally drilled to depths of 80-150 m (these would need to be significantly deeper in the southern part of the basin). Volta Basin Aquifers Discontinuous aquifers occur in the sandstone, quartzite and silexite of the Volta Basin. These are generally unconfined in the north of the basin, but confined by the Mango Clay Formation in the south. Borehole yields are reported between 10 and 250 m3/day (0.1-3 l/s). Typical aquifer thicknesses are unknown however boreholes are generally drilled to depths of 20-100 m. In the unconfined regions, the depth of the water table is usually 3-39 m.
The aquifers of the Volta Basin are generally exploited by hand pumps so there are few issues of groundwater availability. Groundwater from the Volta Basin aquifers have low mineralization. The Volta Basin aquifers are recharged by rainfall and surface water in the northern unconfined region. West African Craton and Dahomeyides Chain The West African Craton (north of Dapaong) and the Dahomeyides Chain are the principal groundwater-bearing formations of the basement. However, these are generally discontinuous aquifers, either related to fracturing or alteration/weathering of the bedrock. The properties of the basement aquifers are controlled by the frequency of fracturing, which varies depending on the nature of the rock, bedding, structural position and tectonic history. Harder rocks are generally more fractured, while schistose rocks are more deformable and therefore less fractured. Alteration or weathering of the bedrock, along cracks and towards the surface, creates aquifers of limited volume that are unevenly distributed in space. These aquifers generally only have thicknesses of 3 to 15 m and are usually exploited by large diameter wells. Aquifers related to alteration or weathering typically have porosities of 2-5%, with hydraulic conductivity on the order of 10-³ m/d. Fractured basement aquifers have lower porosity (1%) and may produce yields of up to 120 m³/day (1 l/s). The weathered basement aquifers are generally unconfined while the fractured basement aquifers may be confined by the altered overburden. The thickness of the water-bearing fractured zone is largely unknown. In the basement aquifers of the West African Craton the depth of the water table typically varies between 0.5 and 20 m, and boreholes are generally drilled to depths of 14-60 m. In the Dahomeyides Chain the water table may extend to a depth of 30 m and boreholes are generally drilled to depths of 35-70 m.
The basement aquifers do not always provide sufficient borehole yields to be considered a viable source. 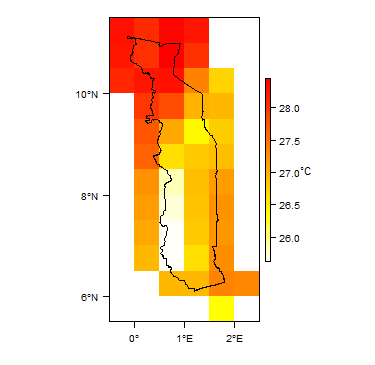 Groundwaters from the West African Craton aquifers typically have low mineralisation, while those from the Dahomeyides Chain can be highly mineralised (up to 1700 microSiemens/cm). High nitrate concentrations (50-620 mg/l) have been reported in parts of the plateau region. Recharge to the basement aquifers is typically from rainfall and surface water. The basement aquifers are laterally discontinuous and thus relatively unproductive. However, exploitation is predominantly by hand pump and the aquifers are generally capable of sustaining low rates of abstraction. Nitrate concentrations in the basement aquifers are often elevated to >50-620 mg/l. The Continental Terminal aquifer in the coastal basin supplies 70% of the public water supply in Lome, through the Togolese Company of Water (TdE). In addition to TdE boreholes, there are many industrial and private boreholes (estimated around 2500 in the Lome Region) that also exploit this aquifer in the Agoe Plateau region. As a result, groundwater levels in the Continental Terminal aquifer have fallen by between 0.5 and 12 m. Saline intrusion is also an issue as a result of overexploitation in the coastal region. Around 85% of the total public national water supply in Togo comes from groundwater (DGEA, 2009). The main groundwater dependent cities are listed in the table below, along with the volume of groundwater abstracted per year by the Togolese Company of Water (TdE, 2010). The main groundwater dependent industries are the phosphates industry (with an estimated groundwater abstraction of 4 M m³/yr) and the brewing industry (with an estimated groundwater abstraction of 0.35 M m³/yr). The amount of groundwater removed by aquifer, both by the TdE and through private boreholes (where known), is given in the table below (MEAHV/DGEA 2013, TdE). Basement Aquifers 0.22 ? ? ? Volta Basin 0.26 ? ? ? It is estimated that there are around 6442 boreholes with hand pumps and 108 improved springs in Togo (DGEA 2009). Electric pumps are used in 80 boreholes by the TdE and in thousands more privately owned boreholes. The key groundwater legislation in Togo is Loi No 2010-004 Portant Code de l'Eau (Groundwater Code). Responsible for the implementation of national policy related to water and sanitation, and for monitoring in collaboration with other ministries or institutions. Responsible for supplying the greatest possible number of urban households at the lowest possible cost, and for ensuring the collection and disposal of waste water in urban centres where the equipment exists. Ensures the management and development of state-controlled drinking water supply and sanitation in urban areas. The Department of Water Resources, which sits within the Ministry of Water, is responsible for groundwater monitoring. However, there are currently no national groundwater level or groundwater quality monitoring programmes. Togo shares the sedimentary coastal aquifer with Ghana, Benin and Nigeria but to date there are no significant transboundary issues. Many of the references below, and others relating to the hydrogeology of Togo, can be found in the Africa Groundwater Literature Archive. This page was last modified on 19 March 2019, at 14:37.